Tracey Snelling - Art Review review of "Where Mr. Wong Sent Me"
Art Review review of "Where Mr. Wong Sent Me"
Chinese-language signs made of crudely looped cords of neon light welcome visitors into Tracey Snelling's mainland debut exhibition at Galerie Urs Meile in Beijing's edgiest new art district, Caochangdi. The proverbial saying"to hit a dog with a meat bun" is one of the many subtle touches that illuminate the uneuphemized local flavor of the show. In its oblique yet pithy implication that human efforts are often self-defeating or contradictory, and that perhaps there is pathos in this quality of ours, the sign also offers a homology of the conceptual framing of the exhibition. If trying to drive away a dog by hitting it with a meat-stuffed bun is unlikely to produce the intended result, so too are many China's attempts to construct its national glory via ham-fisted, myopic "modernization" campaigns that engender social stratification, exploitative relations between labor and capital, and erode the self-sufficiency of local farming economies and create dislocation at the family level through the imperative to engage in long-term migrant labor far from the fields of home, as unintended byproducts of the process. The centerpiece installation, "Wang's House," is a life-sized, rundown, one-room shack typical of the dwellings of the urban poor or one of those millions of rural migrants sojourning in China's swelling cities, which these laborers are building for a backbreaking pittance that must somehow be stretched to feed, house, clothe, school, heal and retire an extended family back in the village. A rickety telephone pole weighed down by a snaking snarl of coiled black wires is a familiar sight in China, emblematic of the belabored communication attendant to the bizarre combination of decay and hyper-newness that characterizes these places. Video projection of the adjacent street provides gritty local ambiance. With its newspapered walls, narrow cot, concrete floor, and lack of amenities, the casual nest of garbage outside the door, the smattering of stray cigarette butts, "Wang's House" succeeds by being perceptively incisive without becoming condescending or judgmental. It epitomizes the light-handed touch that made these works feel both real and surreal, and anthropological without being didactic. The exhibition's title, "Where Mr. Wong Sent Me," comes from a fabled Hong Kong fortune-telling sage, who advised powerful figures about their destinies. For Tracey Snelling, Mr. Wong represents the invocation that sent her to the places that provoked her text-based works, photographs, architectural dioramic scale-models of urbanizing sites caught in the awkward transitional space between past and future: the bucolic splendor blighted by development in Yangshuo, the lopsided modernizing monstrosity of Chongqing, and the ramshackle slums that are neither urban nor rural but rather in flux, such as the multitudes of sub-urban villages identical to Caochangdi (where Urs Meile is located and the artist did her work in residence) before that village became the hottest new art district in town. Her delightful models depicting such transformations are doll-house in size but eschew cutesy sentimentalizing. 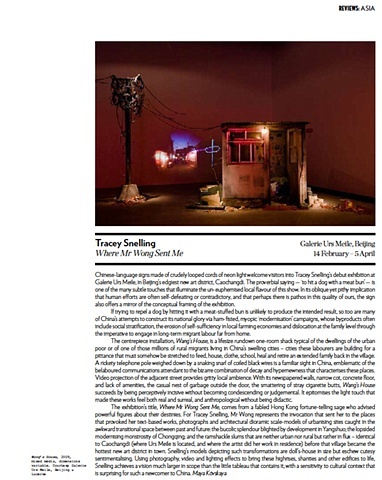 Using photography, video and lighting effects to bring these high-rises, shanties, and other edifices to life, Tracey Snelling achieves a dynamism much larger then the small tableau that contains it, with a sensitivity to cultural context that is surprising for is a newcomer to China.